The island of Sujan, in the Indian Ocean, is inhabited by an ancient tribe that regards horses as sacred animals–and regularly selects the most perfect of the island’s magnificent Arabian horses to serve as the revered “God-Horse of Sujan.” A group of shady American horse-buyers, henchmen of the wealthy and unscrupulous sportsman Crawford (Harry Woods), decide to steal Rex, the current god-horse, after learning from the high priest Tanaga (Mischa Auer) that the island’s equines are not for sale; they get away with the robbery, although Wheeler (Wheeler Oakman), one of the thieves, is captured by the Sujanese in the process. After arriving in America, Rex manages to escape from his kidnappers when Crawford’s efforts to train him as a world-class polo-pony go awry. 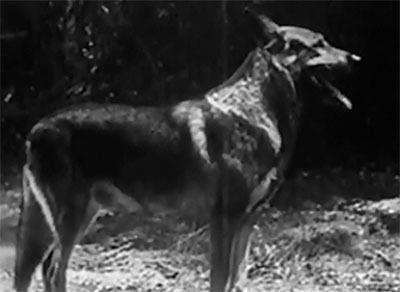 The fugitive horse is befriended by a sagacious stray dog named Rinty (Rin Tin Tin Jr.) and by Crawford’s polo rival Frank Bradley (Kane Richmond), a sportsman as honest as Crawford is crooked; Bradley, aided by Rinty, tries to keep Rex out of the clutches of Crawford and his men, while searching for his rightful owner. 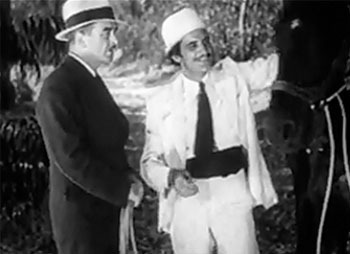 In the meantime, Pasha (Pedro Regas), an emissary from Sujan, conducts his own search for Rex–aided by the slippery Wheeler, who’s agreed to help recover the horse in hopes of evading punishment and receiving a monetary reward. 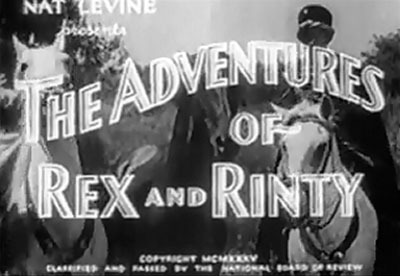 The Adventures of Rex and Rinty is a strong contender for the title of Mascot’s least interesting serial–not because it devotes most of its running time to a repetitious tug-of-war over Rex, but because it fails to intertwine this tug-of-war with any of the subplots that made many equally repetitive Mascot outings involving, despite their thin plotting. Rex and Rinty has no mystery to be solved, no first-chapter murder to be avenged, no fugitive good guy desperately seeking to prove his innocence; without such tension-building plot threads, the back-and-forth struggle for control of Rex–and the shorter-lived duel over a bridle that incriminates the villainous Crawford–never seem very urgent. 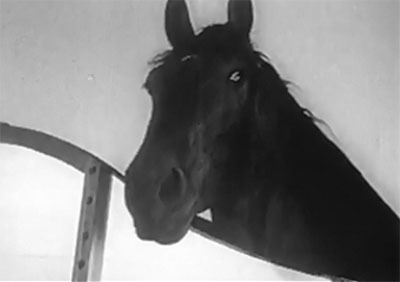 Urgency is further diminished by the unambitiousness of Crawford’s master plan; while the villains in Mascot’s Devil Horse and Law of the Wild intended to use those serial’s coveted steeds as race horses and thus make pots of money, Crawford’s sole reason for ruthlessly pursuing Rex seems to be the desire to acquire a really first-class personal polo horse that will allow him to best his rival Frank Bradley’s polo team. Even in a serial, it’s slightly hard to believe that a rich and respectable citizen would be willing to steal, forge, kidnap, murder, and otherwise risk his wealth and position in pursuit of such a petty goal. Above: The beleaguered Rex looks perturbed as he’s hauled to Crawford’s ranch. Similarly, Bradley is not given any reason for protecting Rex, other than standard heroic nobility; this lack of a strong personal connection between human and equine hero deprives the battle for Rex of the emotional weight that such connections lent to similar battles over stolen horses in Devil Horse and Law of the Wild. The supporting characters Pasha and Tanaga do have close ties to Rex–but are so strange, superstitious, and even sinister that it’s impossible to identify with them in the way that one could with Frankie Darro’s orphan in Devil Horse or Bob Custer’s cowboy in Law of the Wild. That said, the unexpected and rather moving scene at the beginning of Chapter Eleven does succeed in belatedly making the Pasha character fully sympathetic, and also manages to give Bradley a compelling reason for returning Rex to Sujan–while the subsequent journey to Sujan, and the introduction of a new subplot (one that involves an attempted coup by a treacherous subordinate of Tanaga’s), provide a welcome change from the stateside tug-of-war in the preceding episodes. The serial as a whole could have been a lot more interesting if the writers (John Rathmell, Barney Sarecky, Ray Trampe, Maurice Geraghty, and co-director B. Reeves Eason) had moved in this new direction around the serial’s halfway mark, instead of in its last two chapters. Above: Treacherous Sujanese cavalrymen grapple with faithful ones, as a result of the plotting twist introduced in Chapter Eleven. Rex and Rinty’s generally uninvolving storyline isn’t its only flaw; the serial is also surprisingly light on action for a Mascot release, despite being co-directed by that expert purveyor of action B. Reeves Eason (Ford Beebe is the other director). Eason’s flair for spectacle is briefly evident in the mounted processional scenes on Sujan, however, and in the large-scale but disappointingly brief battle between the loyal and disloyal Sujanese guards. Most of the other hand-to-hand combats in the serial are also brief, and somewhat undynamic (featuring as they do more wrestling than leaping or punching); the well-done battle in the road in Chapter Four is the only extended fight scene in the serial, and even it is fairly short. 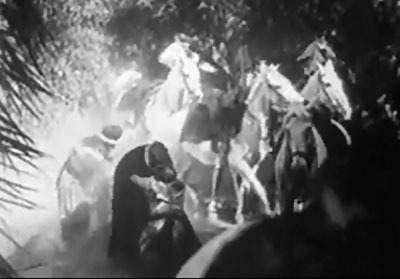 However, though lengthy action setpieces are mostly absent from Rex and Rinty, there are some nice individual stunts scattered throughout the serial–among them the hero’s nimble jump down a steep hillside in Chapter Eight and his leap from a tree onto a villain’s horse in Chapter Nine; Tracy Layne and Eddie Parker handle much of this stuntwork (and also play small acting roles). 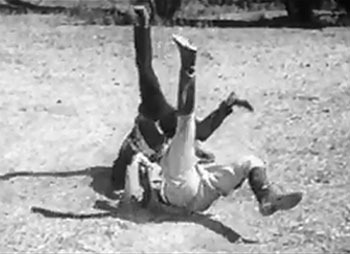 Above: The leap that begins the Chapter Four fight (left-hand picture) and one of the flips executed during the ensuing struggle (right-hand picture). 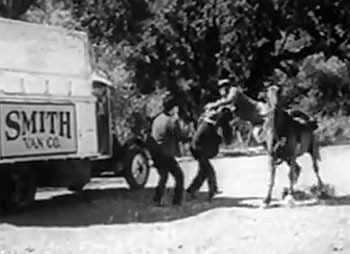 Rex and Rinty’s characters spend so much time speedily riding, driving, or running across Iverson’s Ranch or through the Lake Sherwood area (the serial’s two principal locations) that the serial’s pace remains brisk–although this outdoor activity doesn’t escalate into furious, breakneck cross-country pursuits as often as in other Mascot serials; the chapterplay’s most noteworthy scenes of this type are the Chapter Nine horse/car chase along a hillside road and the chase scene towards the end of Chapter Seven–which has Crawford’s henchmen riding to cut off the heroine’s car and the hero simultaneously galloping uphill and downhill to stop them. 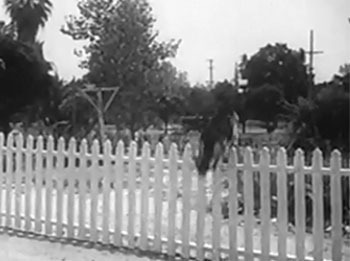 As per the Mascot norm, the Sherwood and Iverson scenery is captured very picturesquely by fine cinematography (provided, this case, by William Nobles). Above left: Rex and Kane Richmond (probably doubled by Tracy Layne) descend a precipitous slope at Iverson’s Ranch. 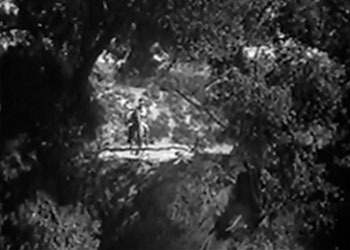 Above right: Richmond and Rin Tin Tin Jr. race through the Lake Sherwood forest. 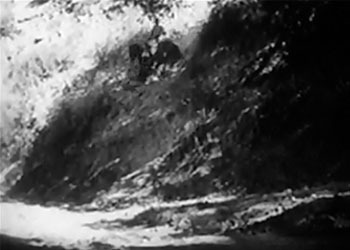 Rex and Rinty’s cliffhangers are rather pedestrian on average, with apparent shootings or horse-falls accounting for half of them; the best of the horse-falls is the nicely shot and carefully set up one that concludes Chapter Five–a scene that has hero Bradley getting knocked off his horse and down a slope by a rigged branch. 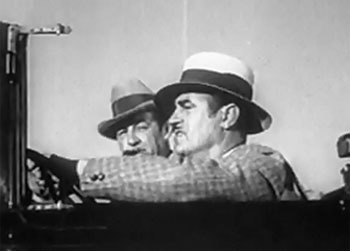 The Chapter Eight shooting cliffhanger neatly manages to imperil both Rex and Bradley (while also putting Rinty in danger of imminent clubbing), but is resolved by a really blatant cheat–as is the Chapter Ten cliffhanger in which the villains shoot Bradley off a steamer gangplank, using the ship’s whistle to cover their shots. 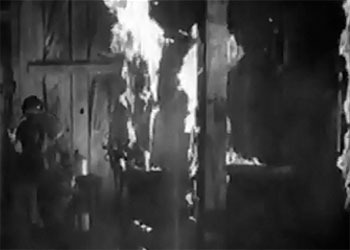 The serial’s best cliffhanger is the impressive barn-fire scene that concludes Chapter Three (and which is followed by an equally impressive escape sequence); the car explosion in Chapter Nine and the Chapter One mine cave-in are good too, although the latter ending features a somewhat improbable live-through-it resolution. Above left: Kane Richmond tries to evade the raging barn fire at the end of Chapter Three. Above right: Richmond rides in pursuit of heavies, unaware that the branch at the mouth of that thicket is rigged to unseat him for the Chapter Five cliffhanger. The most memorable action scenes in Rex and Rinty involve the two titular animal heroes–particularly Rinty. 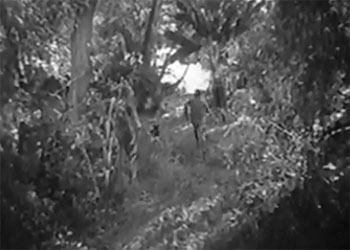 The dog’s introductory sequence, in which he runs through back streets and leaps a fence to catch a fleeing robber’s car, is terrific; none of his numerous subsequent clashes with Crawford’s henchmen are as impressive as this first bit of action, but are all good–particularly the Chapter Three scene in which he continually jumps back and forth over a trailer hitch as he chases heavy George Chesebro, and the Chapter Eight scene in which he steals Wheeler Oakman’s gun and leads him on a wild goose chase through the woods. 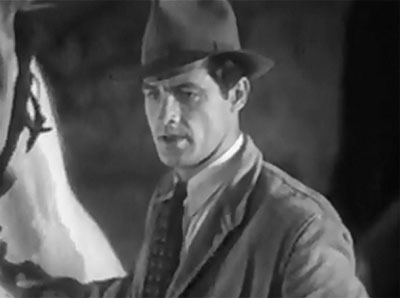 Some of Rinty’s feats, however, are so completely detached from the main plot that they further weaken the serial’s weak plot, by making it seem jarringly disjointed; in Chapter Three,the dog suddenly suspends his trailing of the stolen Rex to save a baby goat trapped in a hole, while in Chapter Five a nasty hobo and a millionaire’s lost child abruptly appear just long enough for Rinty (aided by Rex) to rescue the latter from the former. As for Rex, he spends more of his screen time getting stolen and recovered than actually fighting the villains, but does team effectively with Rinty for the last chapter’s solid climactic cliff-top battle, and also gets a chance to rush around furiously in a polo-training scene and in a full-fledged polo game (incidentally, this game–like the other occasional polo matches in the serial–is carried off quite convincingly, with surprisingly little use of stock footage). Above left: Rinty clears the fence in pursuit of the getaway car. 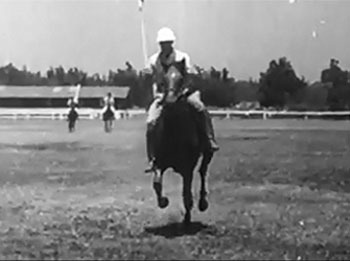 Above right: Rex and Kane Richmond gallop down the polo field. The human cast of Rex and Rinty is an excellent one, from leading man Kane Richmond on down. Richmond, however, is given fairly little to work with; the script’s strong emphasis on his four-footed co-heroes, and its failure to give his character a goal other than helping Rex, makes him seem far more marginal than the human heroes in Mascot’s other animal serials. He ultimately comes off as more of a necessary plot device than a true focal character. Richmond still delivers a fine performance, however, displaying plenty of eagerness, geniality, and quietly confident dash; he sometimes seems a bit stiffer than in his 1940s serials, but this slight stiffness gives his bearing a formal politeness appropriate to the upper-crust polo champ he’s playing. The graceful and rather jauntily self-assured Norma Taylor, a former Broadway actress, comes off as both intelligent and kindly, and makes a fine leading lady–although her character (Dorothy Bruce, the daughter of the Polo Club proprietor) doesn’t have all that much to do. As the Polo Club stableman Jensen, Smiley Burnette provides mild and sporadic comic relief–taking a few pratfalls, doing a little off-key singing, and displaying deadpan puzzlement, generally in more subdued style than in his other serials or his subsequent B-westerns. His most memorable bit–his energetic horse impersonation in Chapter Ten, which tricks the Rex-seeking villains into a futile search of an empty stable–allows him to be both amusing and inventively helpful. Allan Cavan is distinguished-looking and suavely affable as Taylor’s father and Burnette’s employer, but has very little screen time. Above left: Norma Taylor and Allan Cavan rejoice at Kane Richmond’s polo victory. Above right: Smiley Burnette’s musical practice is interrupted by Rinty. Superb screen villain Harry Woods is in top form as the ruthless Crawford, invariably making the character seem formidably capable, unflappably confident, and overbearingly arrogant–whether he’s tersely snarling at his henchmen, aggressively competing on the polo field, or coolly and insolently defying the good guys. Al Bridge figures prominently in the serial’s first half as Crawford’s sly chief henchman Mitchell; his crafty smirk and slow, gratingly harsh voice give him a decidedly reptilian air that contrasts nicely with Woods’ leonine swagger. Edmund Cobb serves as a backup thug in the earlier episodes, but eventually replaces Bridge as chief henchman; he gets several opportunities to gruffly snap orders at lower-ranking heavies Charles King and George Chesebro–both of whom are wasted, in roles that never really give them much of a chance to display their own distinctive screen personalities. Still, King’s phlegmatic caginess and Chesebro’s sneery boisterousness make their few lines distinctive, and keep the disreputable duo from being completely thrust into the background. Gruff and grizzled old pro Jack Rockwell plays another recurring henchman, but isn’t seen as often as the members of the Bridge/Cob/King/Chesebro quartet are. Above left: Harry Woods drives towards his ranch, with Al Bridge beside him. Above right: Edmund Cobb cautions a reckless George Chesebro; Charles King is between them. Greek-born actor Pedro Regas is not particularly imposing or interesting as the dedicated Pasha; an apparently limited mastery of English prevents him from doing much more than smiling or frowning earnestly and delivering his dialogue adequately. He also suffers under the disadvantage of sharing most of his screen time with skilled scene-stealer Wheeler Oakman–who, as the shifty rogue Wheeler, does an excellent job of acting superficially committed to his mission of atonement, while simultaneously making it quite clear that he’s really only interested in the money promised him by the Sujanese high priest, and is ready to revert to villainy at any time. 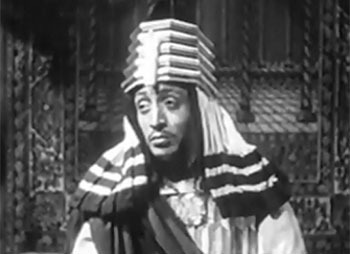 As Tanaga, the aforementioned high priest, Mischa Auer is impressively dignified and mysterious–but only receives substantial screen time in the first episode and the last two, making a few token appearances via mystic telepathy in the intervening episodes. 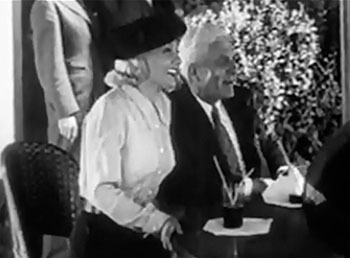 Above left: Wheeler Oakman and Pedro Regas with Rex. Above right: Mischa Auer. Hooper Atchley is entertainingly crafty as Debor, the Sujanese bigwig who joins forces with Woods’ Crawford in an attempt to discredit Rex and overthrow Auer in the last two chapters; Victor Potel is his superstitious military accomplice, and Frankie Marvin–a musical crony of Smiley Burnette’s–is seen as one of the Sujanese guards. Eddie Parker plays another guard, and Tracy Layne appears as a henchman who impersonates an immigration inspector. Max Wagner acts frighteningly crazed in a brief scene as a hobo kidnapper; the wealthy father of the youngster Wagner threatens is played by dignified Wilfred Lucas, but the boy himself is not identifiable (to me, anyway). 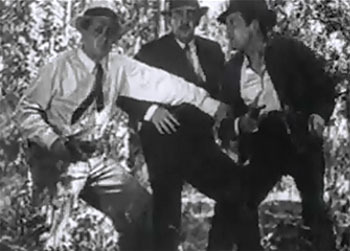 Ralph Byrd makes his serial debut as the alert forest ranger whom Rex and Rinty deliver the rescued child to; Byrd’s ranger also figures in a second and longer scene–in which he gets to ask both hero and heavies several questions in his characteristically quick and businesslike fashion (and triggers the first of the serial’s two flashback sequences). 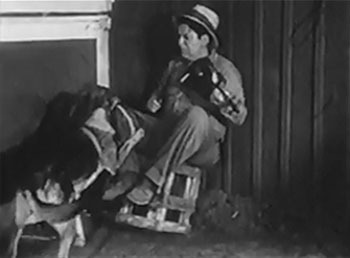 Most unusually for a Mascot chapterplay, Rex and Rinty features several snatches of music on the soundtrack–mostly sprightly or melancholy pieces that accompany the wanderings of the two animal stars; perhaps producer Nat Levine hoped that this embellishment would help to perk up a decidedly lackluster chapterplay (and make it more salable). However, The Adventures of Rex and Rinty remains lackluster; though well-made and well-acted enough to be reasonably enjoyable, its comparative lack of action and (more significantly) its weak and uncompelling story ultimately make it a decidedly forgettable serial. At least you did your best, Rinty. This entry was tagged B. Reeves Eason, Charles King, Edmund Cobb, Ford Beebe, George Chesebro, Harry Woods, Kane Richmond, Mascot serials, Ralph Byrd, Rex--King of the Wild Horses, Rin Tin Tin, Smiley Burnette. Bookmark the permalink. The only reason this story was made was it was Mascot’s policy of making one serial a year featuring animals. I refer to ADVENTURES OF REX AND RINTY as THE RETURN OF LAW OF THE WILD. Kane Richmond was, of course, a vastly superior hero than Bob Custer. While the story didn’t have that much interest, it at least is one of Mascot’s more polished serials, with superior direction, photography, and editing. Still, after the wildly entertaining and imaginative THE PHANTOM EMPIRE, I wonder why the studio came up so empty here. Not one false note as far as this review is concerned. No need for my comments. I rate this ** out of *****. ** out of ***** Good review. One thing though, about Harry Woods’ character–“hard to believe that a rich and respectable citizen would be willing to steal, forge, kidnap, murder and otherwise risk his wealth and position.”–I’m not so sure, unfortunately. Some of our most respected coaches have been willing to look the other way from some pretty bad criminal behavior in order to field a team that can win the big ones. I agree that you can find too many examples of sports coaches condoning criminal behavior; I’m just not sure if even the most ruthless of the “winning is everything” crowd would be so foolhardy as to actively commit violent crimes themselves in order to field a winning team. Of course, though Woods’ willingness to get his own hands dirty makes him seem wildly reckless, it also, in a way, makes him seem more worthy of grudging respect than those coaches who just turn a blind eye to others’ criminal antics.